Is one found at the bottom of a City of Chicago check to Second Amendment Foundation, for attorney's fees and costs, in the amount of $399,950. Looks like Alan Gottlieb holding it. OK, so it's probably an automatic signature, but the thought of how Rahm must have reacted to the news that it had be sent is amusing. 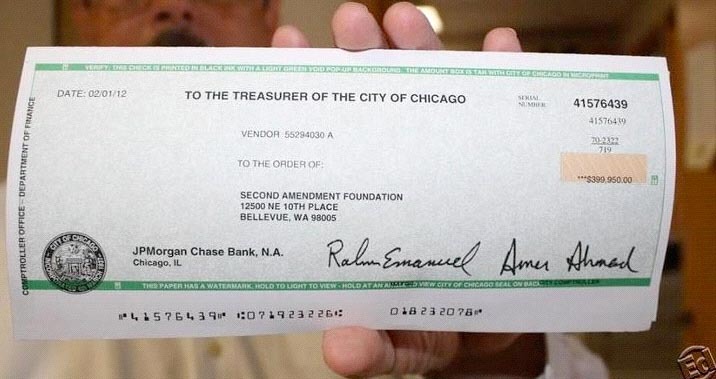 Essentially, Chicago involuntarily becomes the funder of the next round of pro right to arms challenges. It's a start folks. More to follow I hope. 10x woulda been much better. Now they should write some checks for the loved ones of the people who died because Chicago wouldn't let them have a gun to defend themselves. ...I'll bet you could sell that photo, framed, at the NRA convention. I'd put it on my wall, just so folks would ask me what it meant. Apropo of nothing much . . . years back when electronic sigs were just being "invented", I researched some of the legal aspects. If Rahm's e-sig shown on the check is valid for disbursement of large amounts of money, and he has now made it available to the public, do you think it might lead to (gasp) fraud? Of course, if we deduce and conclude based on his accumulated record, anything Rahm has done or is presently doing constitutes fraud upon the public. Given that he has exposed the validity of his sig to the vagaries of internet security, why would anyone trust his signature? My advice? Take it to the bank and get proof of successful completion of the deposit and subsequent transfer of funds. Otherwise, you know, based on his documented record . . . .
Great picture and a great victory for gun owners. Thanks for posting. Looks impressive, but I think it pales in comparison to the donations the anti 2nd groups get.